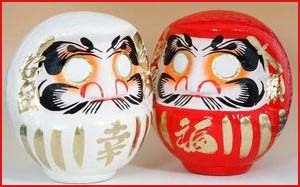 tsuchi Daruma 土達磨 "Daruma from Earth"
. 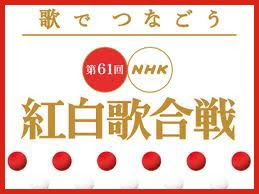 WKD : mimizu naku　蚯蚓鳴 mole-cricket singing . 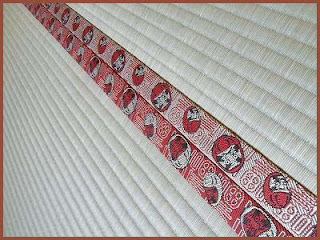 is a shoot hissatsu technique.
. Tatami floor mats 畳　. The heri　縁 border, edges of a tatami mat are made of various materials, with various patterns. 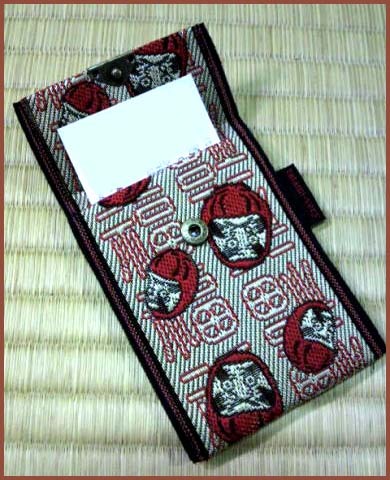 Lately, the use of tatami has become less and less and the heri brocade weavers have found new objects for their products.
. gamakuchi, gamaguchi がま口 Daruma purse . 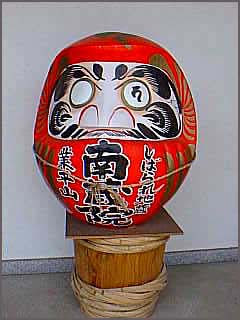 This is a special Daruma with a rope around the body. 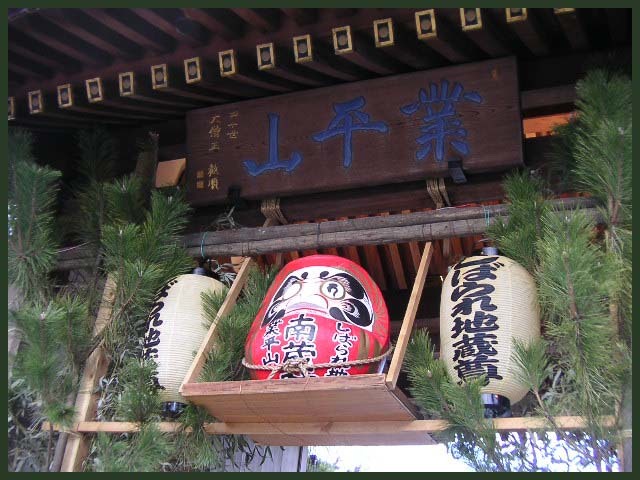 You buy it when you make a comittmend (for example give up smoking or drinking sake) and to BIND you to your promise, the Daruma gets a rope to remind you. 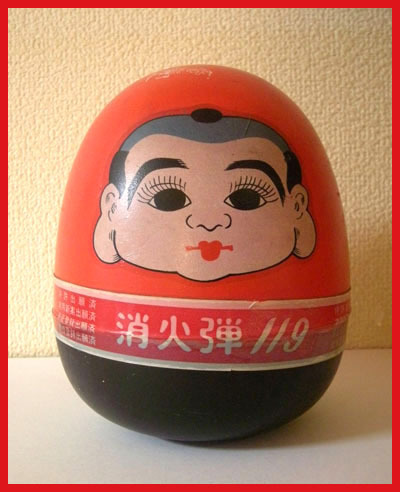 You can buy such a Daruma for a New Year resolution on the Year End Market on December 31 to January 2 at the tempel Nanzoo-In, Tokyo. 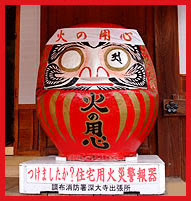 This Daruma custom is closely related to the Jizo statue below. Daruma to tie with a rope are sold at the New Year Fair from December 31 to January, 2. 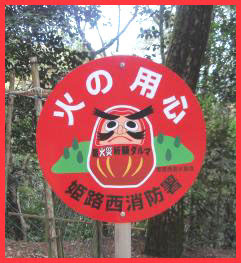 Then a special Daruma ritual (Daruma kuyoo だるま供養) is held. Nanzoin Temple in Katsushika, Tokyo, is famous for the Shibarare Jizo, a rope-tied guardian deity. 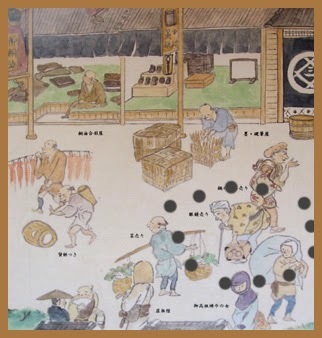 The legend of Shibarare Jizo goes back to the early 18th century. 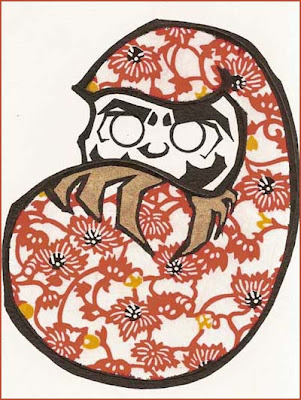 On a hot summer afternoon, a kimono store clerk pulling a cart laden with kimono cloth passed a Jizo statue, then stopped to rest in the shade of a tree by the Jizo statue and dozed off. 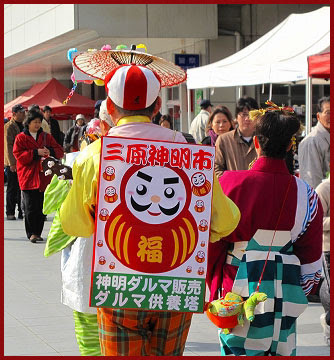 When he woke up, his bundle of goods was gone. In a panic, he rushed to the magistrate’s office. 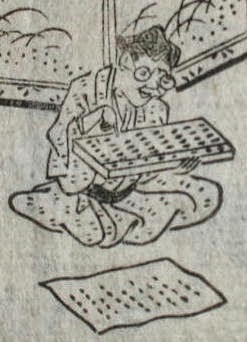 Then-renowned magistrate Ooka Echizen 越前守 carried out an investigation. 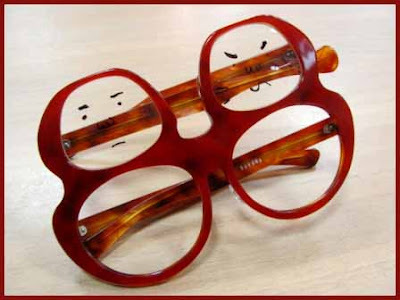 As no witnesses could be found, the judge decided exceptional measures would be needed to solve the case. After pondering the matter, he decided that the statue of Jizo, a god that protects travelers, had been derelict in its duty. 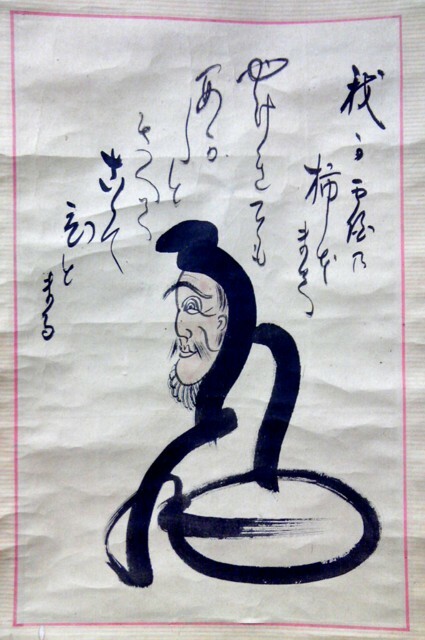 Echizen instructed his constables to return to the crime scene and arrest the Jizo statue. The men lifted it from its heavy stone pedestal and bound it with ropes. 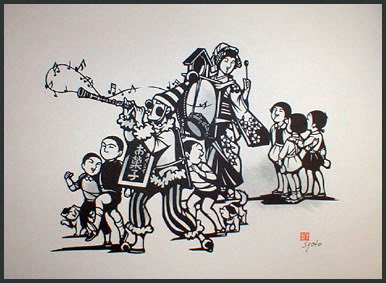 Word of the trial spread, and a crowd of spectators thronged to the magistrate’s office yard. 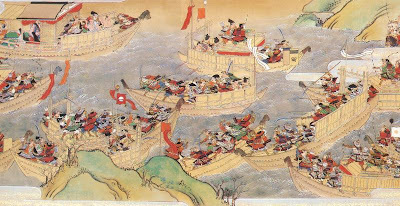 Then the magistrate tactically ordered the gate closed, and said, “breaking into the divine court is unforgivable.” As punishment, the magistrate fined each spectator a roll of cloth. 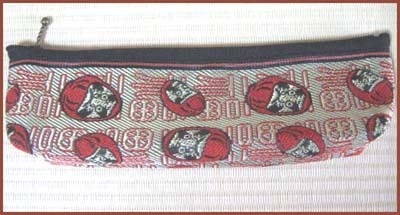 They went home, and brought some cloth to the magistrate. Among the pieces brought by them, Echizen found one belonging to the clerk, which lead to the arrest of a notorious ring of thieves. 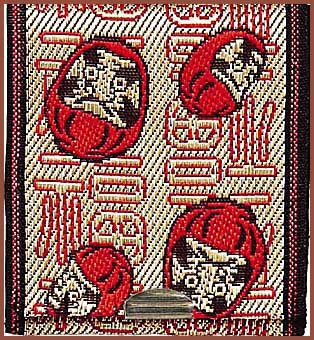 Today, people believe the Jizo of Nanzoin temple grants all wishes — including protection from robbery, better health, matchmaking (tie a knot), protecting you against evil, and more. 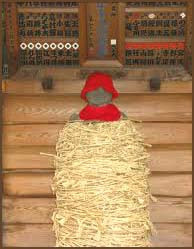 When you make a wish, you bind the Jizo with a rope. After your wish comes true, you untie the rope. All the ropes tied and untied are made into a bonfire at 11 p.m. on New Year’s Eve. This form of Jizō is relatively new. 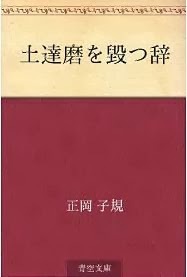 The earliest Japanese text to mention Shibarare Jizō (to my knowledge) is the Edo Sunago 江戸砂子, dated 1732, which cites the curious habit of binding a Jizō statue at Rinsenji Temple 林泉寺 (Tokyo) in ropes before beseeching the deity for divine intervention. 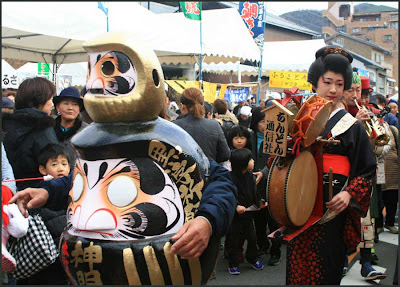 There are various legends about this form of Jizō. 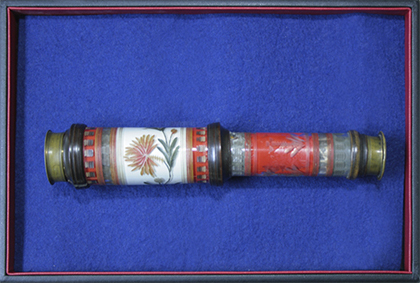 Three are presented below. Although String-Bound Jizō is clearly an Edo-era creation, the deity's origins may have drawn from a much earlier story appearing in the Taiheiki 太平記 (circa 1371 Japanese text), which describes a soldier taking refuge in a Jizō sanctuary after fleeing from a battle. 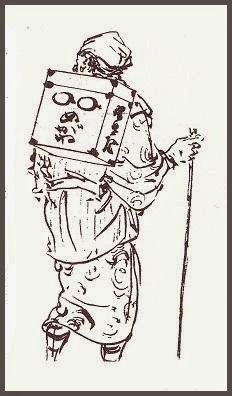 As the enemy drew nearer, Jizō appeared in the form of a priest who was then captured by the enemy in place of the soldier. 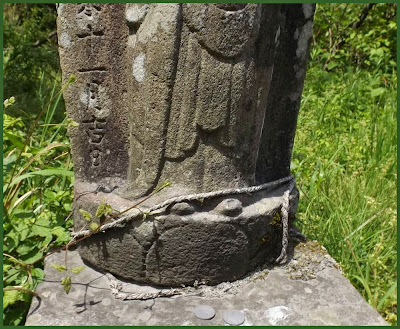 From that point forward, the Jizō statue in the sanctuary showed markings where it had been bound. 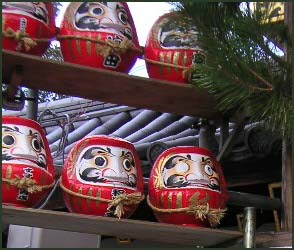 Rinsenji Temple (Tokyo). 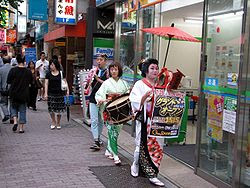 Text and photo from Yomiuri Shimbun, Sept. 9, 2003. 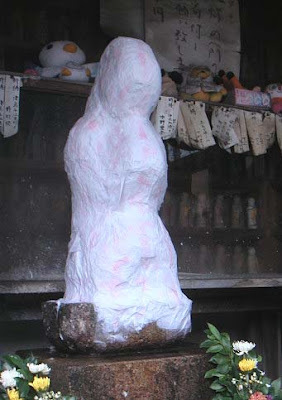 Paper-Pasted Jizō (Kamihari Jizō 紙張地蔵). The gentle, round face of Jizō, the guardian deity of children, can barely be seen amidst the layers of cord tied around the stone statue of the god at Rinsenji Temple in Bunkyo Ward, Tokyo, which was erected in 1602. The stone statue called "Shibarare (string-bound) Jizō" is said to have been donated to the temple by its founder, Ito Hanbei, in memory of his late parents. There are other Shibarare Jizō statues in other locations around Tokyo. 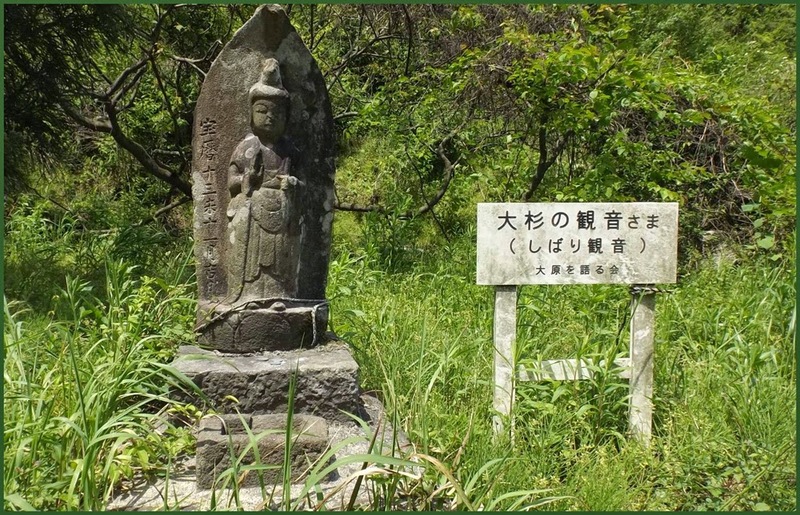 However, the statue at Rinsenji appeared in "Zenigata Heiji," a detective story set in the Edo Era (1603-1868), written by novelist Kodo Nomura (1882-1963). Local residents originally started tying strings around the statue when offering prayers for the recovery of stolen or missing items. 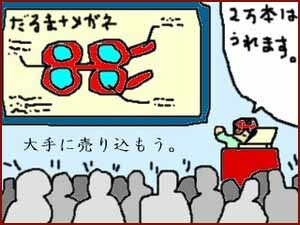 When their prayers were answered, people were supposed to remove the string. 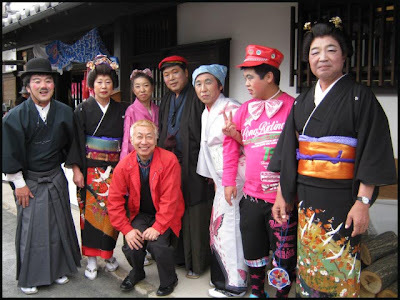 These days, however, many people visit the temple to offer prayers for various other reasons. 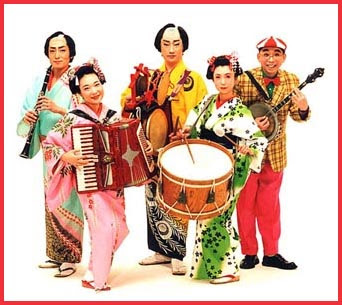 "At the end of every year, we hold a ceremony to remove all the strings and burn them. 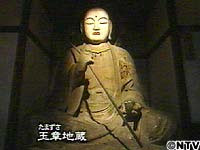 But the statue was already covered with new strings in January," said the chief priest at the temple, Shin-jin Eda, 40. 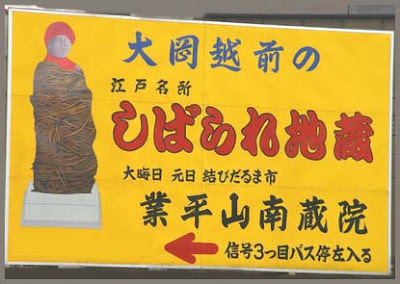 Located at the Yōshū-in 陽秀院 (Nagoya), the statue is covered with paper prayer slips. 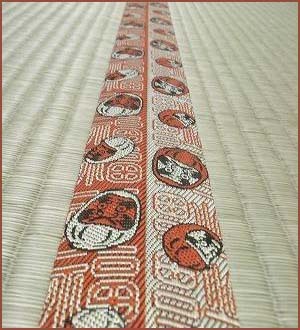 Devotees write their prayers on the slips and then paste the slips on Jizō's body.
. Zenigata Heiji 銭形平次 . 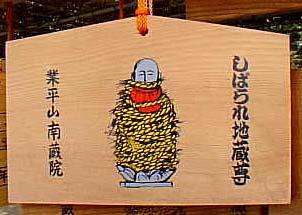 This is another Jizo in a temple in Kyoto, plastered with the many love-letters that Ono no Komachi received and plastered on it. The statue is about 3 meters high. 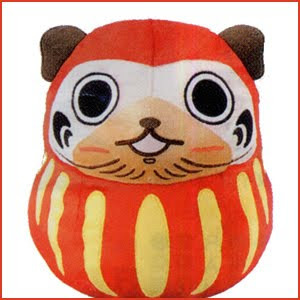 CLICK for more Musubi Daruma photos !
. 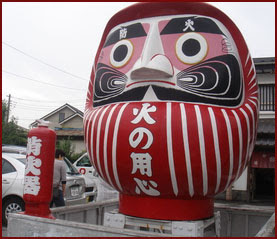 Koshigaya Daruma 越谷市だるま . 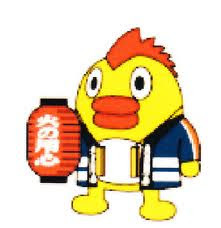 Click for more kokeshi !
. 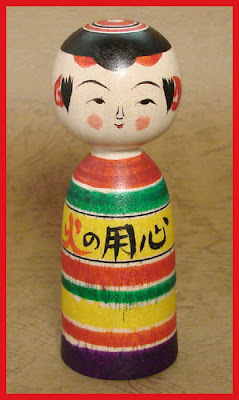 Kokeshi, Wooden Dolls こけし .
. Kakinomoto no Hitomaro 柿本 人麻呂 . 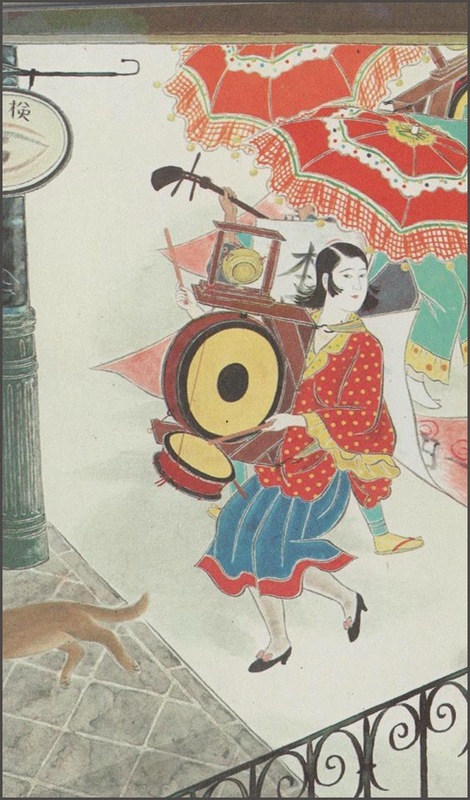 One or two would walk along the streets and make a loud noise with the wooden clappers, so the neighbourhood knew it was safe to sleep deeply for a while.
. WKD - Fire (kaji　火事) . Click for more "Hi no Yojin" goods.
. hi no yoojin 火の用心 watch out for fire - goods .